A 13-year-old Hispanic girl without significant medical history presented with 6 months of left-hand swelling and pain. 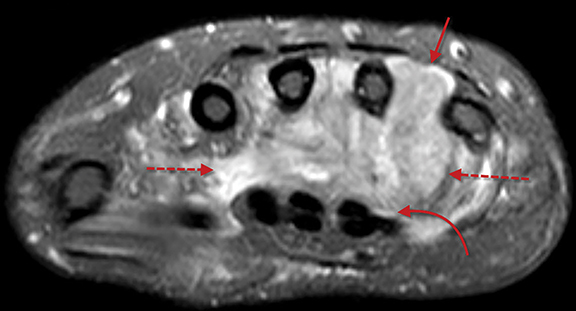 Axial MR images of the left wrist with T1-weighting and T2-weighting with fat saturation (Figure 1) show a large, infiltrative lesion located deep to the distal carpal tunnel. The lesion is slightly hyperintense to muscle on T1 and markedly hyperintense on T2. There is interdigitation between the proximal 2nd through 5th metacarpals (arrow) with no evidence of cortical destruction. 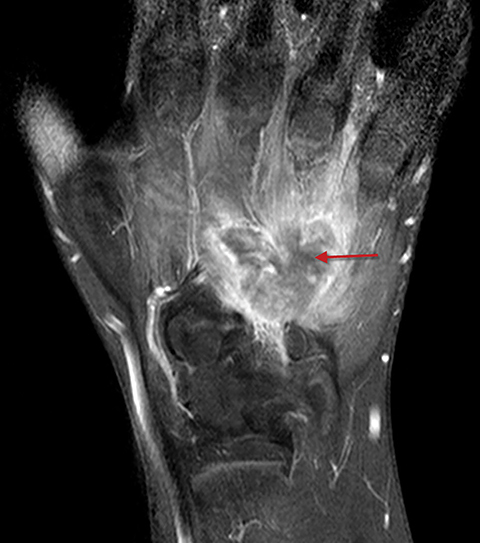 The lesion replaces the palmar and dorsal interosseous musculature, as well as the adductor pollicis muscle (dashed arrows). 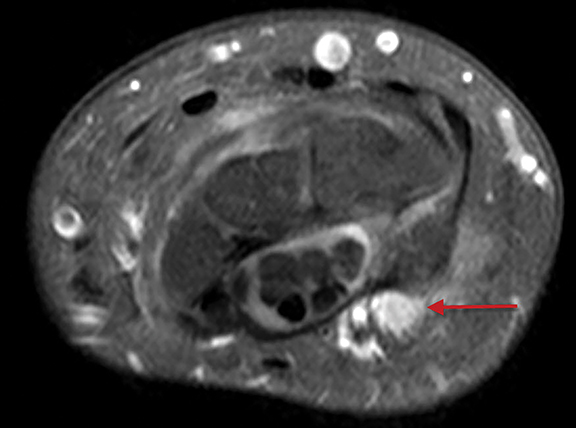 There is minimal extension of the lesion into the carpal tunnel with mild mass effect upon the deep flexor tendons (curved arrow). 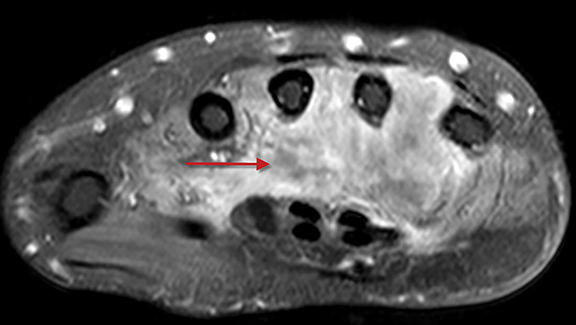 Axial and coronal T1-weighted, fat-saturated, contrast-enhanced MR images of the left wrist (Figure 2) show heterogeneous enhancement of the lesion with a few areas of non-enhancement centrally (arrow). 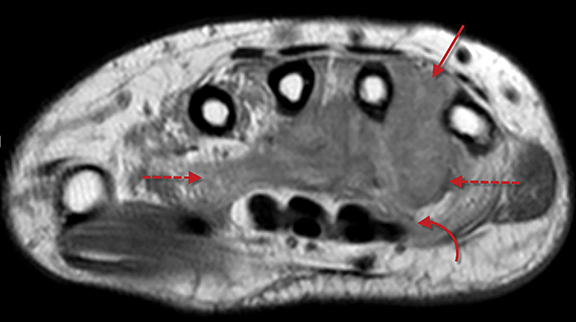 Axial and sagittal T1-weighted, fat-saturated, contrast-enhanced MR images of the left wrist (Figure 3) reveal extension of the lesion proximally into Guyon’s canal along the course of the ulnar nerve (arrow). 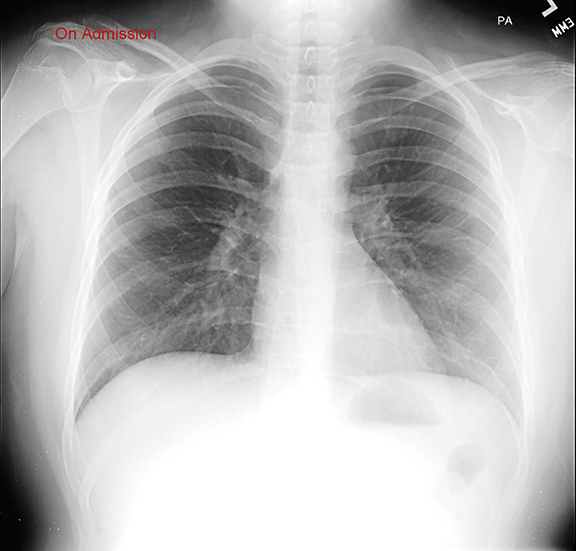 During the initial workup for the left wrist lesion, a frontal chest radiograph showed no significant abnormality (Figure 4A); the patient subsequently underwent below-the-elbow amputation. 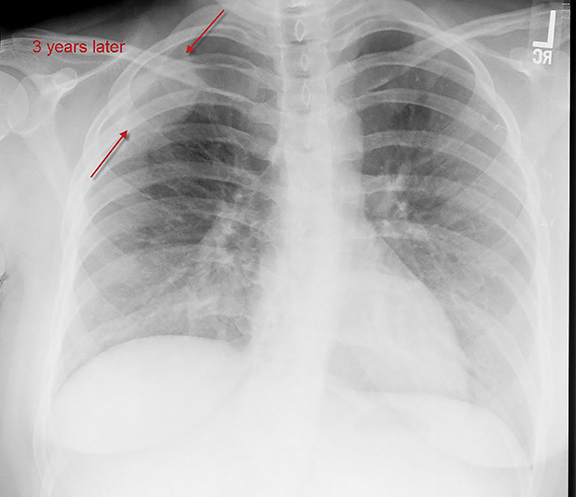 Three years later the patient had a follow-up frontal chest radiograph (Figure 4B), which showed a large mass in the right upper thorax (arrows). 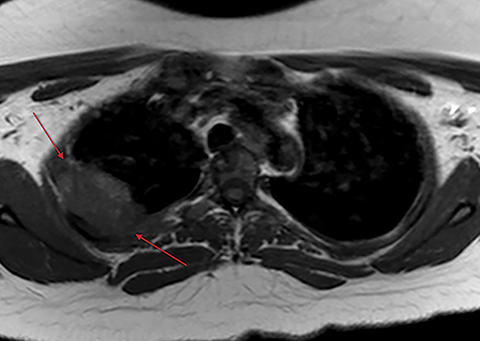 An axial T1-weighted MR image (Figure 5) shows a large right apical pleural based mass (arrows). The differential diagnosis is fairly broad and includes phlegmon/abscess, nerve sheath tumor, synovial sarcoma, fibrous histiocytoma (benign, malignant and angiomatoid forms), angiosarcoma, and fibromatosis. Epithelioid Sarcoma (ES) is a soft-tissue tumor of uncertain cellular lineage, and the most common soft-tissue malignancy of the hand and wrist in adolescents and young adults. It typically presents as a slow growing painless mass or multiple masses with or without overlying skin ulceration. There is a male predominance of 2:1.1 Two types of ES have been described, conventional, or distal, type and proximal type.2 The distal type is more common in younger patients, with 60% involving the flexor surface of the distal upper extremity. Imaging features are best delineated with contrast-enhanced MRI to evaluate extent prior to biopsy and/or surgical resection. On precontrast T1-weighted MR imaging, the signal is usually isointense to muscle with possible T1 hyperintensity secondary to hemorrhage. On T2/fluid sequences, the mass is typically hyperintense with areas of central necrosis and surrounding edema. 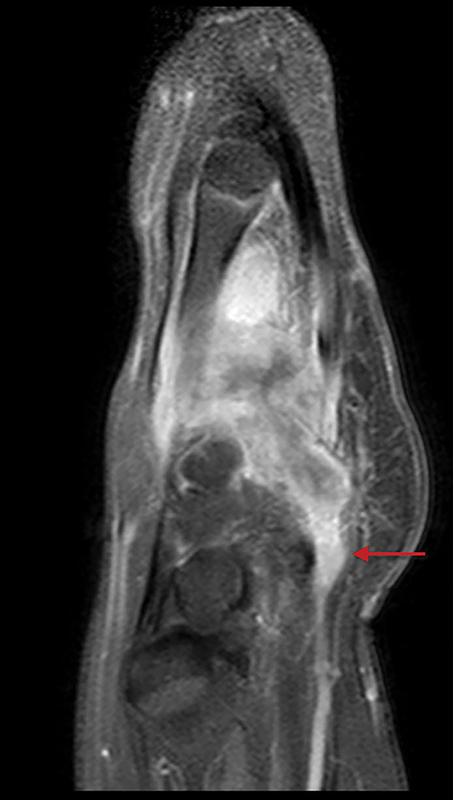 There is usually heterogeneous enhancement, often with areas of necrosis. A characteristic finding, as shown in the present case, is propagation along fascial planes, tendon sheaths and nerves. Radiography and CT may reveal a soft-tissue mass with speckled calcifications. There may be adjacent osseous remodeling; however, cortical destruction and invasion are rare. The clinical prognosis of ES is fairly poor, with significantly high local and metastatic recurrence rates. Local recurrence rates for the distal type have been reported up to 77% with metastases present in 45%.1 The most common sites of metastasis are the lungs and local lymph nodes, and interestingly, a high metastatic rate to the scalp.2 Five-year survival ranges from 50-85%.1Management is based on aggressive local excision. Soft-tissue masses often present with a nonpecific imaging appearance, and tend to have a wide differential diagnosis. Epithelioid sarcoma is an aggressive soft-tissue sarcoma, and the most common sarcoma involving the distal upper extremity in adolescents and young adults. When presented with a tumor in this location, epithelioid sarcoma should be included as a primary consideration, particularly in a tumor that demonstrates a characteristic infiltrating pattern along the volar fascial planes. Goldblum J, Folpe A, Weiss S. (2014) Enzinger & Weiss’s Soft Tissue Tumors, 6th Edition, Saunders, Philadelphia, PA. Lo H, Kalisher L, Faix J Epithelioid sarcoma: radiologic and pathologic manifestations. Am J Roentgenol. 1977; 128:1017-1020. Crowder R, Jorgensen SA, Towbin AJ, Towbin R. Epithelioid sarcoma. Appl Radiol. 2018;47(1):33-34. Prepared by Dr. Crowder while practicing at Maricopa Integrated Health System, Phoenix, AZ; Dr. Jorgensen and Dr. Richard Towbin while practicing at Phoenix Children’s Hospital, Phoenix, AZ; and Dr. Alexander Towbin, while Practicing at Cincinnati Children’s Hospital, Cincinnati, OH.